Not all AC current sensors are created equal. Some are able to measure energy usage with acceptable accuracy, while others can pin down your energy bill to within 0.2%. What makes a Revenue Grade Current Sensor? Typically, current transformers are available in two accuracy classes: standard (or regular) CTs, as well as revenue grade CTs. What accounts for the difference? Revenue grade transformers (also known as revenue grade sensors) are IEC or ANSI-certified to provide the highest level of accuracy for revenue metering applications. ANSI Metering Class CTs (Revenue Grade AC Current Transformers) are ideal for power monitoring applications in which high accuracy and minimum phase angle error are required. Like other AC current sensors, revenue grade current transformers measure the amps of current passing through a conductor. This measurement, along with voltage, is used to determine the total amount of power being consumed during any given period. Because revenue current transformers offer superior accuracy, they are ideal for applications that require maximum accuracy and precision, such as energy and demand metering, load surveys, and tenant sub-metering. While revenue grade current sensors are available in a variety of styles (including hinged split-core, toroidal solid core, and flexible rope styles – called Rogowski coils), they are set apart by their superior performance and robust design. Why bother upgrading to a revenue grade current transformer? First, you probably are legally obliged to do so if you’re dealing with subtenant billing (you’ll see why soon). But secondly, the difference is in the dollars. Revenue grade current sensors are first-in-class when it comes to accuracy and precision. While standard current transformers are able to measure with 1% accuracy, revenue grade current sensors can cut that in half: achieving 0.5% accuracy with some getting as close to the mark as 0.2%. 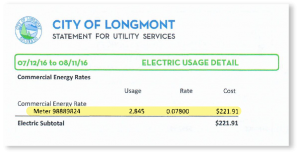 Just take a look at this real-world commercial electricity bill, which illustrates the difference in dollars between having a standard current transformer and a “revenue grade” current transformer. This bill is typical of a small apartment building that might be interested in subtenant billing. Luckily for them their rates are incredible at only 7.8 cents a kWh, but folks in other parts of the country are paying about double. If we were to monitor this same building with standard current sensors and high accuracy current sensors we would see a difference of a couple of dollars. 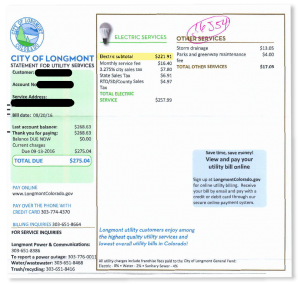 This might be tolerable for folks getting a sense of their consumption, but no tenant is going to like to hear they are paying for electricity they aren’t using. More importantly, the law agrees with the tenants, which is why it is required to have revenue grade CTs in order to sub-meter. In conclusion, the small additional cost for a revenue grade current sensor is worth it when accuracy and precision are paramount. Interested in learning more about the benefits of revenue grade current transformers and how they can save you money? Contact a consultant at (303) 772.6100.